While I had many goals and aspirations for 2014, my main focus was trying to find balance in my life. To achieve that balance, I ended up creating a lot of healthy habits and letting go of old beliefs and patterns. I learned so much about things I never thought had anything to do with balance. I guess that is why I didn’t feel like my life was in balance in the first place. For the past few years at various times I’ve had experiences of burnout from trying to work a full time job, grow a business, enjoy a happy life with meaningful relationships and take care of my physical, emotional and spiritual needs as best I could. This year was no different and I had a very difficult time in the winter as my workload felt like it was at an all time high. I developed adrenal fatigue syndrome and effectively hit rock bottom. I knew this wasn’t balance. When it felt like all the pieces were crumbling, I completely surrendered and let go of any attachment to an outcome. After letting go, everything started to fall back into place. It was one final lesson (I hope) in realizing that I can’t continue that same pattern over and over again. I can celebrate this now, because I feel like it’s a lesson I finally nailed! I’ve learned and integrated so much this year, it’s hard to narrow it down to the most meaningful, but these are the top habits I created to bring balance into my life. One major shift that took place this year was discovering my core desired feelings – the ways I want to feel every day to experience a full and satisfying life. They are joyfully radiant, connection, flow, abundance and supported in case you were wondering. I became focused on how I could feel those feelings every single day and became way less focused on arbitrary goals I had previously set for myself because I hoped that they would make me feel something that I thought I might want. I became more aware of how I wanted to be instead of focused on the things I wanted to do. This was HUGE for me. Plus, through this I also learned to let go of the belief that I’m only lovable or worthy if I do this thing or that thing. I know that my worth is inherent on a conscious level, but in 2014 I actually started to to believe it at a soul level. I would highly recommend checking out The Desire Map by Danielle LaPorte if you’re interested in discovering your core desired feelings. In 2014, I learned that I really didn’t have any boundaries and that was causing me to give more than I wanted to and take on more than I could reasonably do. My expectations of myself were too high. I learned how to set boundaries and took back some of the power in my life I had given away. I now use my core desired feelings as a guide. I check in with them whenever I have to make a decision and I’m not sure which way I should go. I set boundaries around how I would spend my time and used my desired feelings as a guide to ensure I was staying in alignment with it all. If an opportunity doesn’t satisfy at least one of my core desired feelings, I won’t do it. With that being said, I know there are some things that I have to do that I don’t particularly enjoy, like cleaning the house. I have learned to shift my perspective about it though from something I hate doing, to something that can help me feel a desired feeling, so a clean house can help me feel flow because I’ve cleared out stagnant. Another huge shift was learning to recognize when I needed support and how to ask for what I needed. I’m discovering that this is a hard thing for many people, because often we don’t know what we need and we certainly don’t know how to ask for it. Because I understood my core desired feelings and delved a little into non-violent communication and discovering my needs, I was able to recognize much easier when a need wasn’t being met. When you have that clarity, it’s so much easier to ask for what you need. To explore more about how to identify needs, check out my musings on the subject in this post. Over the past year and a bit, I’ve been part of a Creation Circle. A small group of us meet monthly to learn content that can be integrated into our lives to help us create the amazing life we want and deserve. This group has been so instrumental in helping me feel supported, which is clearly important to me as it’s one of my core desired feelings. I’ve got so much other support too, from my naturopath, acupuncurist, massage therapist, chiropractor, kundalini dance facilitator, yoga teacher, meditation guides, from my husband, family and friends. Support showed up in a big way in my work life this year in the form of a committee for the NAIT United Way campaign that I Chair. I truly appreciate the support I was given to run the campaign. For the last 6 years I had only a little support, but this year I had a committee of six other people helping me out. That support helped me to stay in alignment with my boundaries around the amount of time I feel comfortable putting into work. This year, I celebrate all of the support I have called into my life and the ease and joy it has created. Celebration is another thing we worked on integrating into our everyday lives in the Creation Circle. Practicing celebration helps me to feel and recognize all the ways abundance shows up in my life, it helps me to feel present and satisfied with what I’ve achieved and it helps me to feel joyfully radiant! I’ve made gratitude a daily practice in my life and I’ve posted what I’m grateful for on Facebook for 113 days so far. I can’t begin to express how much this has changed my life. It has helped open my heart more than I ever could have guessed. This isn’t to say that I’m happy all the time, but I now choose to see the gift in each challenging situation that shows up, whatever that may be. This practice has allowed me to expand my context for recognizing how my core desired feelings show up in my life. When I first started out, I had very specific and limited ideas of what each feeling looked like, for example joyfully radiant meant teaching hoop classes but now I can experience that feeling from just about any activity. Practicing gratitude has taught me, it’s not what I’m doing that helps me to feel the ways I want to feel, rather, what I’m searching for is a state of being. Practicing gratitude gives me an opportunity to be the way I want to feel. I celebrate and am grateful for all the gifts practicing gratitude has given me. As I move forward to 2015, I want to continue embodying all of my core desired feelings with a focus on flow as my theme for the year. I think balance is really just about finding the flow space in life anyways. Some times are busier than others, so balance is more about going with the flow and accepting life as it comes, accepting the good and the bad. Flow is also about trusting my intuition and inner guidance. If I’m in the flow, I can let go of attachment to a specific outcome and remain open to the endless possibility that awaits. 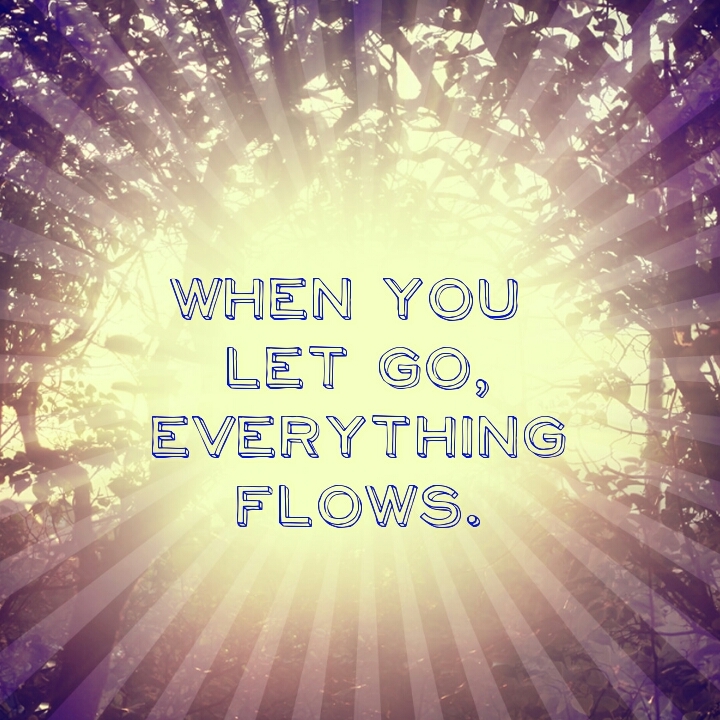 Flow is also about letting go of timelines. Goals with timelines are important, but I’m also no longer going to beat myself up if I don’t achieve everything in the initial time frame I had set out for myself. I’ve noticed this year that many things I had on my 2014 vision board will actually happen in 2015, and I’m completely OK with that. If I embody flow, I’m sure my other desired feelings will naturally follow. I can see the flow in abundance and support showing up as giving and receiving, watching the flow of money come and go, the flow of the seasons and the food that is provided. I can see the flow in connection literally as the energy flowing in my body or as the flow in conversation with a friend. If I go with the flow I believe that I will experience all of the above and then I will certainly feel joyfully radiant. While I don’t have a big list of to do’s in 2015, I do have a small list of big things to focus on. I want to continue supporting the local hoop dance community with Pop Up Prop Jams, I want to create an awesome reunion with my sister for our family in August, I want to support and inspire other women to with the Radiant Soul Women’s Retreat I’m hosting in September with the support of a few lovely and amazing women like Kacie Beluse Knight from Dancing into Being, Anastasia Kutt from Luminous Tranquility and Nina Infinity from Infinity Hoopdance. I’ve got a lot to look forward to! I am setting the intention that I will experience 2015 with ease and flow, that I will feel supported and connection and that I will feel joyfully radiant all year long. I hope your 2015 brings you all you desire!